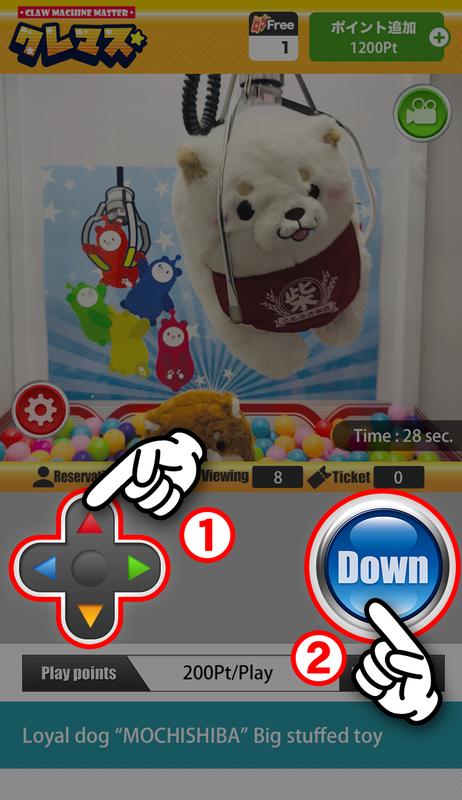 you can easily operate the claw machine via internet. This is the specific descriptions. Other users are playing. You can also watching. The user won prizes. It is in a state of supplementing prizes. 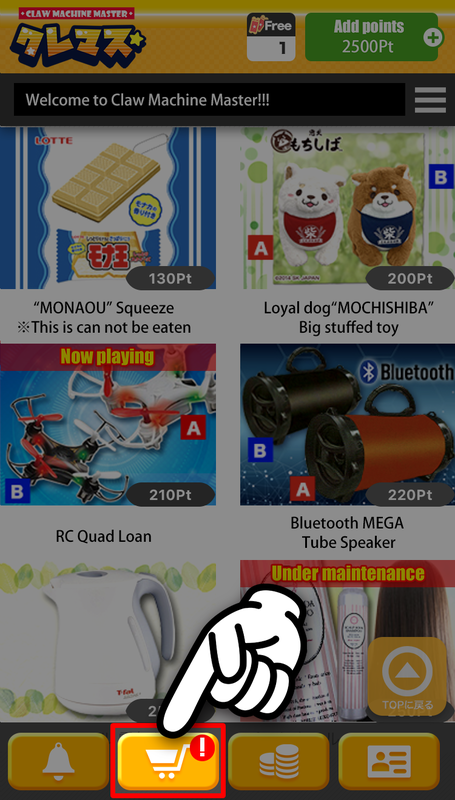 Maintenance of the Claw Machine and exchange of prizes are in progress. Now Playing: Other users are playing right now. You can also watch them playing. Item is supplemented: The user has won the prize. The staff are replacing the items. Under Maintenance: The machine is under maintenance or the items are being replaced. 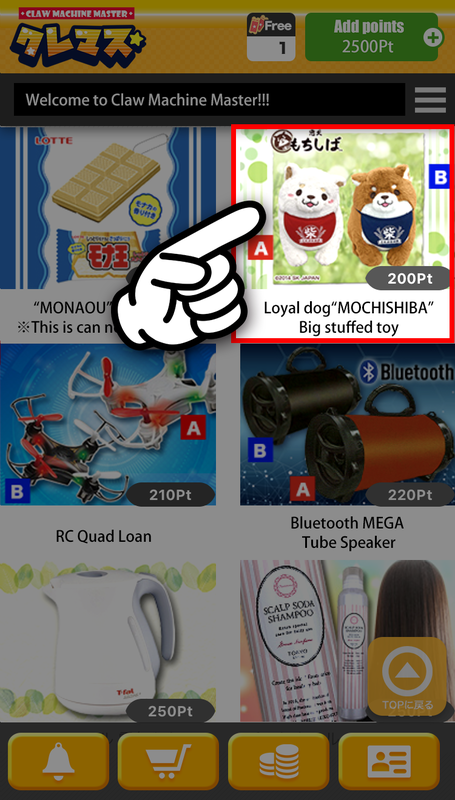 Choose the Claw Machine you want to play from our list of prizes! The number of players making reservations for this Claw Machine. 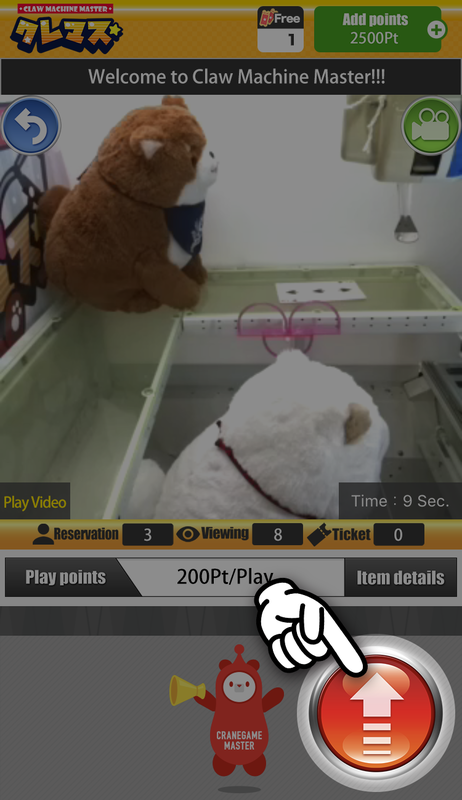 The number of viewers of this Claw Machine. The number of free play tickets you own. 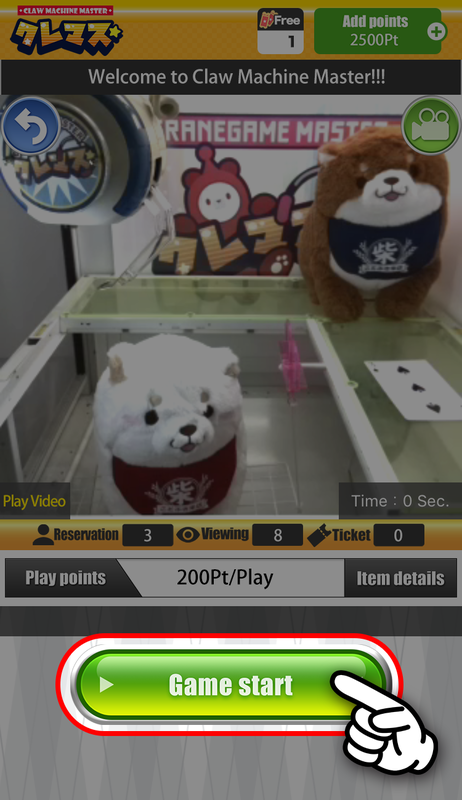 Points shown will be necessary to play this Claw Machine. The specific information about the item displayed in the claw machine. You can also see the conditions of acquisition here. Start your play by pressing "Game start" button. However, if someone else is already playing, please press the "Reserve a game" button and wait until the previous player to finish their game. Your remaining points will appear here. By pressing the button, you can purchase extra points. The camera are located front and side of the item. Press this button to switch the camera angle. 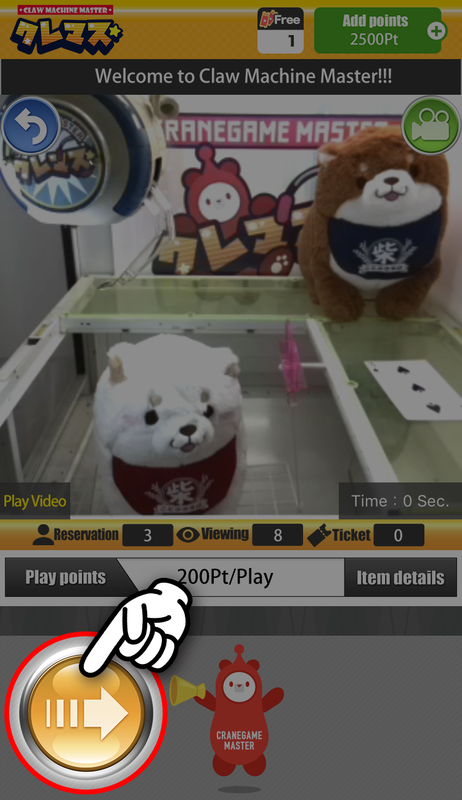 Free play tickets or points are necessary to proceed to game. You can move the claw horizontally by pressing the arrow button! The claw will keep on moving horizontally as long as you hold down the button. The operating time is 30 seconds. Please operate the claw within the time limit! The camera angle automatically switches to the side. 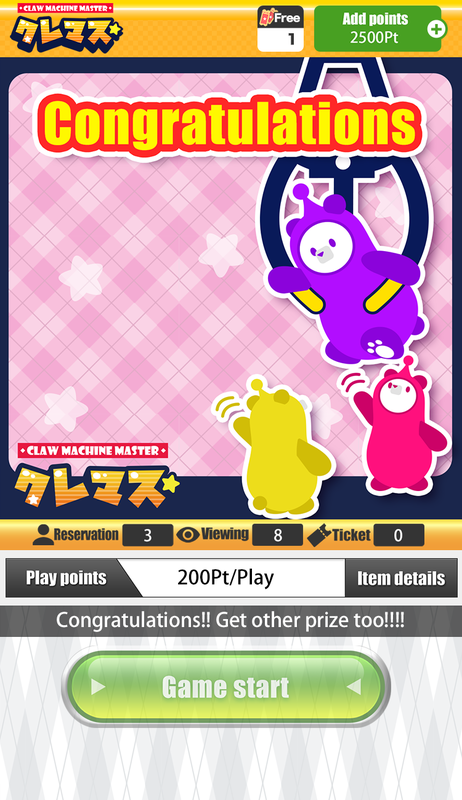 Next, you can move the claw vertically by pressing the arrow button! The claw will keep on moving vertically as long as you hold down the button. You can also switch the angle to the front camera by pressing the camera button on the top right of the screen. 1)1)You can operate the claw any times with the four-way controller. Adjust the position of the claw by changing the camera angle! 2)When you’re in position, click "Down" button to grab the item! The screen above will be displayed when you acquired the item. If you haven't acquired your item in one play, you can continue playing. When you win the item, you can request shipping from the cart icon at the bottom of the TOP page. Please keep in mind that you will lose your item after 14 days from acquisition. 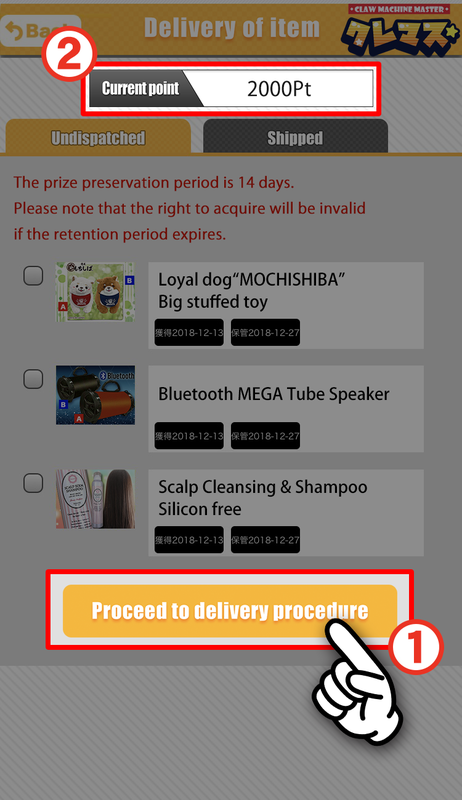 1)Please select the prize you want to ship from the "Undispatched" tab and press "Proceed to the procedure" button. 2)Points are necessary for the shipping. Please check the remaining points and proceed for shipping. *We recommend you to ship multiple items at once. *We recommend you ship it all together. 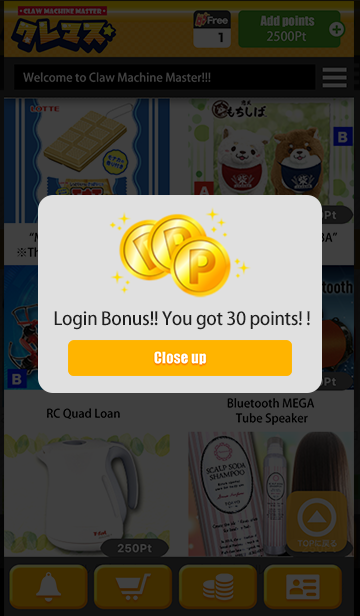 There are lots of unique services in "Claw Machine Master" such are login bonuses and events for getting points! Please enjoy our unique and exciting service! If you have any questions, please feel free to contact us from the inquiry form.